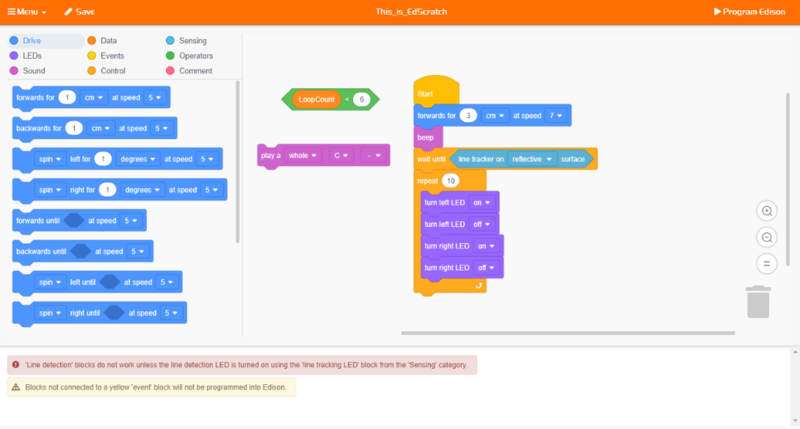 EdScratch, a vertical block-based programming language for the Edison robot based on Scratch, is now available. You can access EdScratch through the online app at www.edscratchapp.com. EdScratch combines the ease of drag-and-drop programming with powerful functionality and versatility. The result is a robot programming language that is easy to learn and offers a robust platform for computer science education. And just like all of our robot programming languages, you can use EdScratch for free! If you are familiar with MIT’s Scratch programming language, the look and feel of EdScratch will likely seem very familiar to you. EdScratch was developed using the Scratch Blocks code base developed by the MIT Media Lab from the Blockly code base developed by Google. Just like Scratch, EdScratch is a vertical block-based language which allows you to drag-and-drop blocks together to make a program. Designed specifically for use with Edison robots, EdScratch is a robotics programming language that is simple to use, lots of fun, and lets you tap into Edison’s capabilities in exciting ways. The online EdScratch programming environment is designed to deliver meaningful computer science education through an easy-to-use interface. EdScratch’s intuitive layout and the simplicity of block-based coding makes EdScratch an ideal programming language for students aged 10 and up. Helpful features, like the built-in bug box, make the transition to using more complex programming structures approachable even with no prior coding experience. As students gain confidence in coding, they can do even more by controlling inputs, manipulating data, and creating and utilising variables, making EdScratch a perfect platform to use Edison’s features in engaging, creative ways. 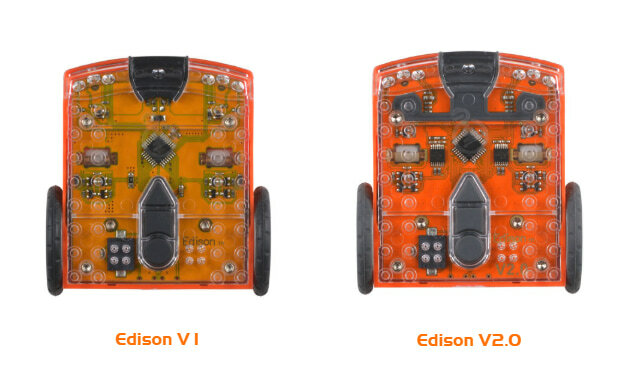 All Version 2.0 Edison robots are fully compatible with EdScratch. I have Version 1 Edison robots. Can I use EdScratch? 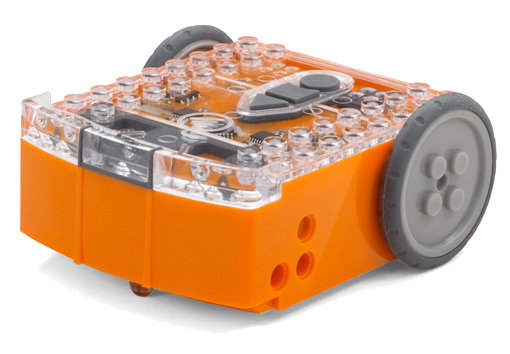 As a general rule, you can use Version 1 Edison robots which have the latest firmware update with EdScratch, but there are a few limitations, especially when it comes to Edison’s motor outputs. When using blocks from the ‘Drive’ category in EdScratch with Version 1 robots, only use ‘seconds’ as the distance units input parameter. Using ‘cm’, ‘inch’, or ‘degrees’ as the distance units input parameter will not work with Version 1 robots and can result in some bizarre behaviour from the robot. Likewise, it is recommended that you avoid using the sensing and event blocks related to ‘drive strain’ with Version 1 robots as these blocks can cause the robots to behave erratically. What’s the reason behind these limitations? The key cause has to do with some physical differences between Version 1 Edison robots and V2.0 Edison robots. Edison V2.0 robots have wheel encoders which allow the robots to travel specific distances at exact speeds. These encoders enable the robots to use distance units other than time, including centimetres, inches and degrees. Version 1 Edison robots do not have encoders and therefore are not capable of the precision driving required to use these other inputs. In developing EdScratch, we wanted to make sure that EdScratch could be a tool that both educators and students would love. To help you get the most out of EdScratch, we’ve developed a range of free, downloadable educational resources including student activities, project ideas and a teacher’s guide. The free EdScratch Lesson Plans Set includes a complete curriculum for teaching computational thinking and computer science using EdScratch and the Edison robot. The lesson activities and project ideas in the set are organised into six units beginning with an initial preparatory unit and culminating in an open-ended project-based unit. Designed for flexible use, you can easily choose just the activities that suit your interests or teach the entire curriculum! The student set of the EdScratch lesson activities contains worksheets and activity sheets designed for independent use by students in Year 5 (10-11 years old) and above. With 98 activity options organised into six units, the student set contains a mix of structured and open-ended activities that introduce key concepts and learning objectives while engaging students in an active exploration of Edison and EdScratch. The complementary teaching guide offers teachers and instructors overviews, delivery recommendations and other supporting information for the EdScratch lesson activities to help make teaching EdScratch easy and fun. We’ve also created a series of free video tutorials organised around the units in the EdScratch lesson plans. Each tutorial video in the series examines new elements in the EdScratch environment and the related computer science concepts from the lessons. You can learn more about EdScratch on the EdScratch page on our website, including a full list of FAQs and troubleshooting help. What can you make with EdScratch? Send us your ideas, pics and videos at social@microbric.com or add them to the online community of Edison awesomeness on Pinterest, Facebook, Twitter, Instagram or YouTube. As a small rural school, we are looking at Edison robots as a cheaper way of getting our students engaged with coding and STEM thinking. Having played with one for a short time using EdScratch as a programming language, I’m just love, love, loving it! I’m just wondering if you have thought about making EdScratch a downloadable app? With our rather dodgy internet connections it would be great to have an app that could be used as a stand alone piece of software. Thanks so much for your kind words! We are so glad you are loving EdScratch as much as we do! We know that for anywhere with poor or no internet connection, having dedicated, downloadable versions of the apps would be great. Unfortunately, at this time, there is no offline or downloadable version of EdScratch in development. As such, you do require an internet connection to use EdScratch. EdScratch requires the code you program in the environment to be compiled in order to be downloaded into the Edison robot. To ensure the compiler works correctly across all platforms and keep costs such that we can deliver EdScratch at no charge, delivering through an online solution is the best option for EdScratch. This online solution also enables us to ensure that we are able to provide updates and improvements into the live system for all users on an ongoing basis. Do you have printed student activity books available for purchase? You can then print the PDFs from any standard office or home printer, or have a local print shop print and bind them to your specifications. We hope you enjoy them! My class is having difficulty downloading their programs. They are getting a failed beep with each try. What can we do to get them working? If you still need help, our technical support team will be happy to help you sort out whatever’s happening, but they will need a bit more information from you. Head to our contact page at https://meetedison.com/edison-robot-support/contact-us/ and complete the form. One of the support officers will be able to help from there! Professional development – the missing link for tech in the classroom?